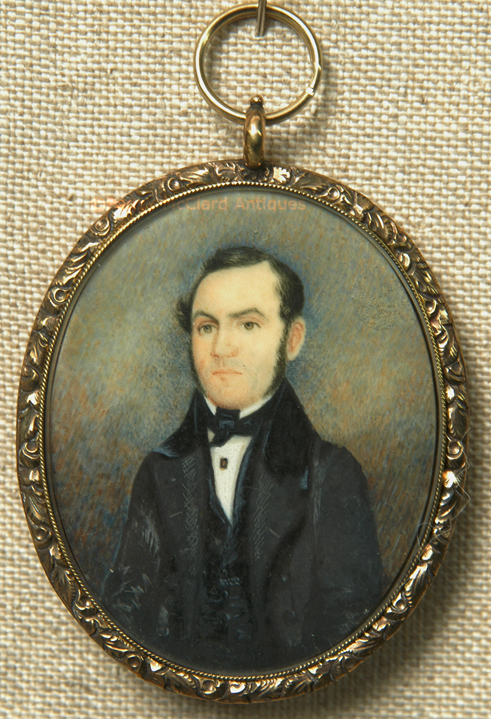 This American School folk portrait miniature has all of the wonderful characteristics we love in our folk art minis! I have had a few portrait miniatures by this hand. Either this hand is Abraham Parsell, early in his career, or is an artist who surely was influenced by Parsell. Like the work of Parsell, the natural wafer has been subtly scored to help hold the paint. Like Parsell's early work, the background is stipled with brown, orange, pink and blue. Parsell's later work would make use of the same colors in the backgrounds, but arranged into the appearance of a sunset. Like Parsell's work, the skin tones are subtle, the eyes piercing, eyebrows thin but arched. However, Parsell's sitters gaze directly at the viewer and this gentleman looks off to his right just a bit. Like Parsell, this artist used gum arabic to highlight the dark clothing. As with Parsell's early work, the gentleman's hands do not show (later Parsell work is known for having the sitters almost always holding something so that their long slender fingers are in view). 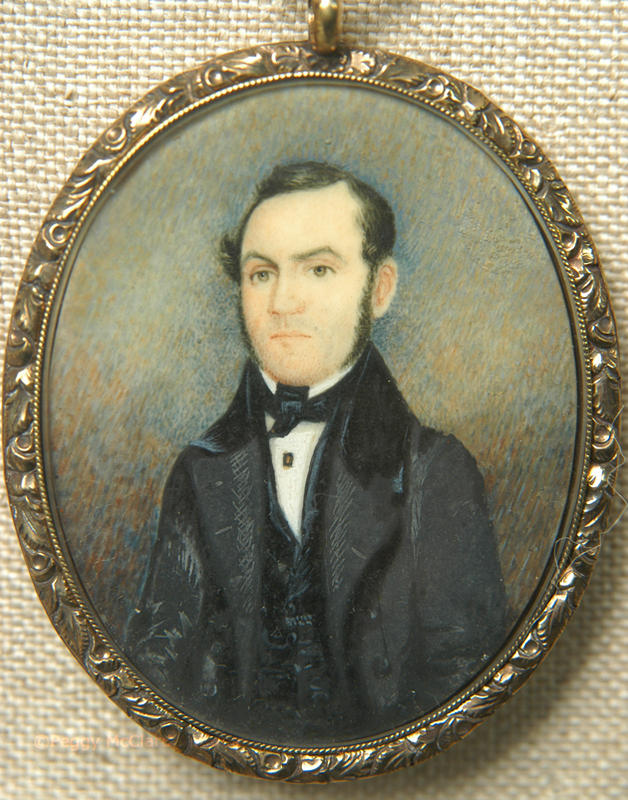 So, is this portrait miniature an early piece by Parsell or done by a contemporary of Parsell? I can't say and I won't make that "attribution". I am only pointing out the similarities. I do wish someone would put a name to this hand because I have come across it several times in the past and it is really lovely work. 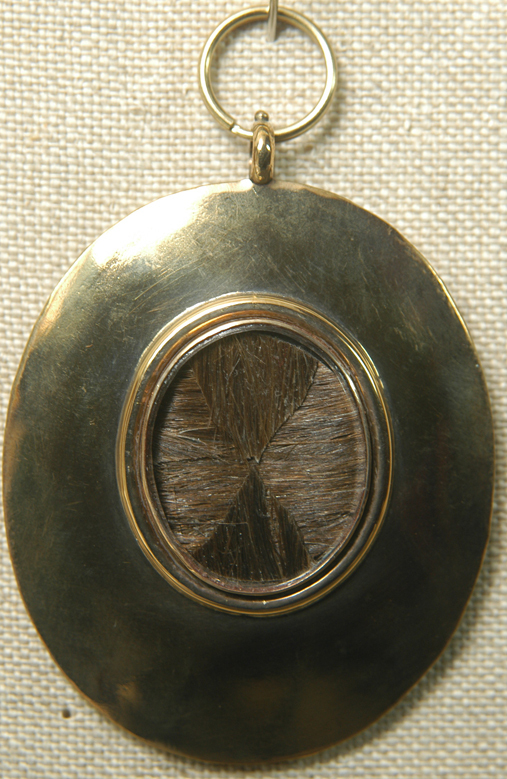 This wonderful piece of American folk art resides in its original pendant frame with the chased edge. It came to me without glass so I had Wiebold Studio replace the glass, front and back, add a simple plaited hair arrangement to the back receptacle and regild the pendant frame. There was the tiniest bit of paint loss at the top of the gent's head (which gave him a flat-top hairstyle), so I had Wiebold touch up the paint just a little in that one spot. 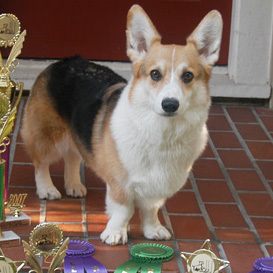 Other than what I have just disclosed, the condition is wonderful. The white markings that you see on the coat sleeve are where the artist scratched away some paint to show detail of the dark clothing. Pendant 3" (not including the loop) x 2 1/8". The loop brings the total length to 3 1/2". It will be a great addition to any collection--and just think how exciting it will be to own when some scholar discloses the identity of the artist! Circa 1820.